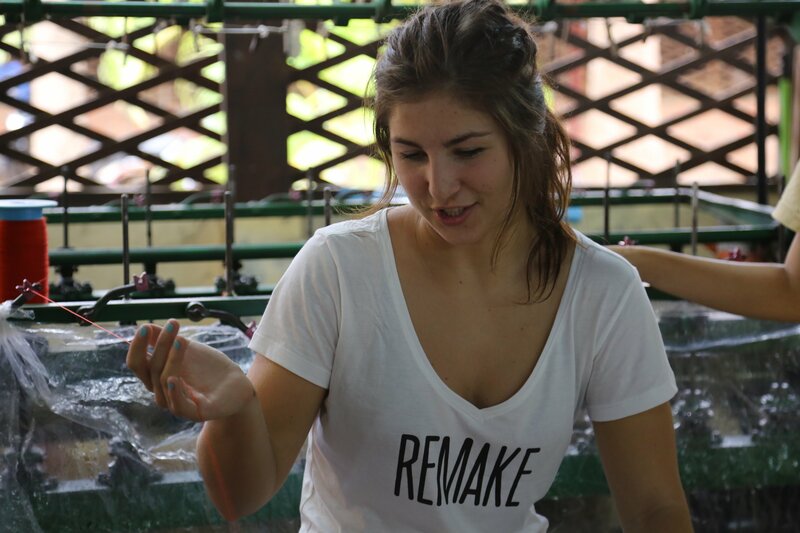 Casey Barber had begun working on her sustainability-driven senior thesis collection when the opportunity to join Remake’s “peace corps” journey to Cambodia’s garment making communities came up. An all expenses paid flight to actually see garment factories? An opportunity to deeply connect with her purpose in the fashion industry? She was in. Luckily, Casey was one of the Parsons School of Design students selected to join Remake in their journey, Made in Cambodia. Her experience meeting the women who make the clothing she will one day design forever changed the way she views her fashion career. Photo: Selfies are universal. 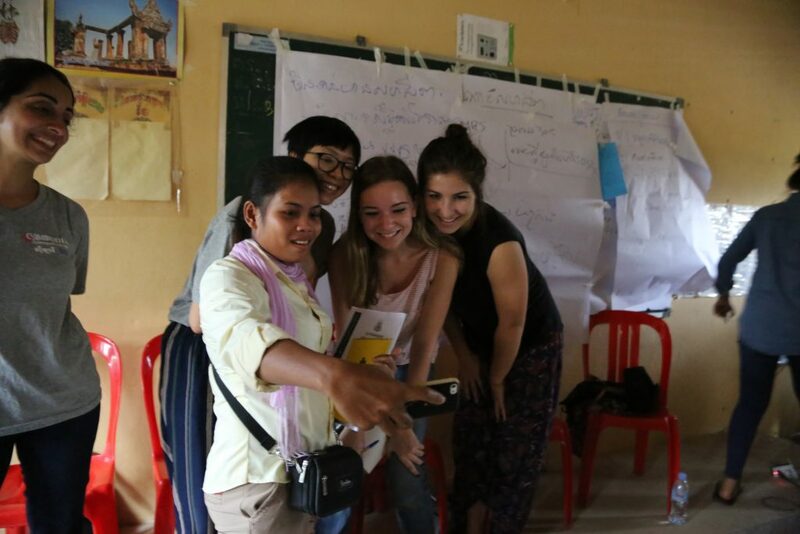 Casey (right) and her classmates Anh and Allie take a selfie with a garment maker they got to know during the Remake’s immersive journey, Made in Cambodia. Casey had just begun to work on a series of looks that focus on kinetic draping and sustainability to lower the environmental impact of fashion. She used creative patternmaking as a tool to combat her frustration with the oversaturation of clothing in the market. “I wanted to design cool clothes that are versatile, comfortable, and sustainable, through new and thoughtful making processes,” she said. While in Cambodia, she was inspired to think further than the environment and integrate social well being in garment production. 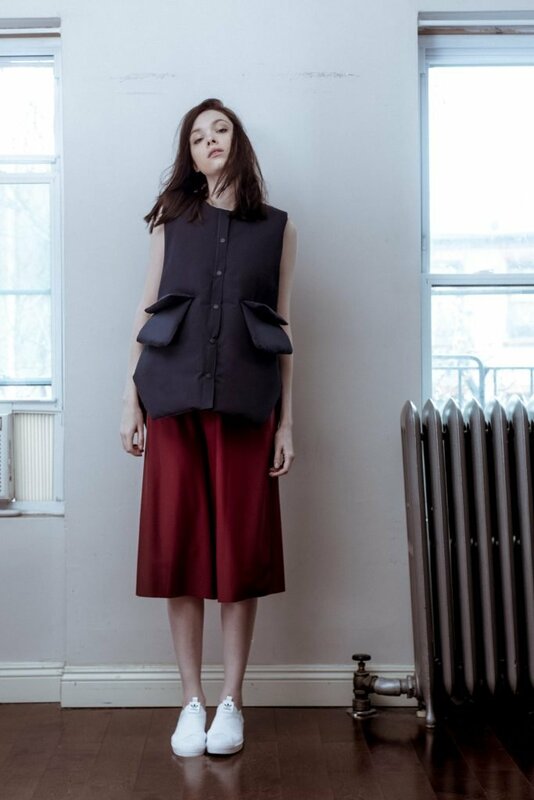 Photo: A look from Casey’s thesis collection. Through her making process and designs she showed what conscious fashion means to her. All of the clothing in her thesis collection is made from “really amazing sustainable fabrics,”– from recycled plastic bottles and even fishing nets that pollute the ocean. Seeing the human impact of each aspect of our fashion drew her to textile companies that show complete transparency of supply chain and those that provide job opportunities for people in small communities. By knowing exactly where her fabrics came from, Casey was able to educate others about the positive impact of ethical fashion. “I was able to have very exciting conversations with people about my work because I was able to educate them on the textile companies I was working with and how they made their materials… Being able to show how my fleece starts with local plastic collection programs in Haiti and Honduras and ends with manufacturing in the USA, sheds light on sustainable practices that are often in the shadows of supply chains,” she said. Casey sourced fleece from Thread, which is made of 100% recycled PET and celebrates the individuality of its makers. “They have amazing stories on their websites of their workers, it connected to our experiences in Cambodia. The trip was so personal because we got to meet and speak with so many women and men employed in the industry,” Casey said. Photo: Casey’s thesis collection used sustainable fabrics that reduce waste, helping to clean up our oceans and landfills. As Casey transitions from student to fashion designer, she hopes to work for a brand with similar values, stating that it’s more important to work for a brand that is standing up for environmental and ethical rights than it is to work for someone cool and trendy. She is also taking aim at keeping the conversation around ethical fashion going. Photo: Casey sourced part of her collection’s fabric from Thread, which uses 100% recycled PET and celebrates the individuality of its makers. “One of things I anticipated about this trip was feeling hopeless after completing our itinerary. It is such a heavy and complex issue and sometimes as one designer — especially just graduating — you cannot help but feel so small and powerless,” Casey said. Allie, a dual fashion-journalism major, was one of our selected Parsons School of Design students who came on the Cambodia Journey, where we connected designers with makers to build a more human-centered fashion industry. Allie’s great grandmother used to sew in NYC's garment district. Graduating from Parsons and recently interning at Oscar de la Renta, she feels like her family's life has come full circle - from being a line worker to designer.